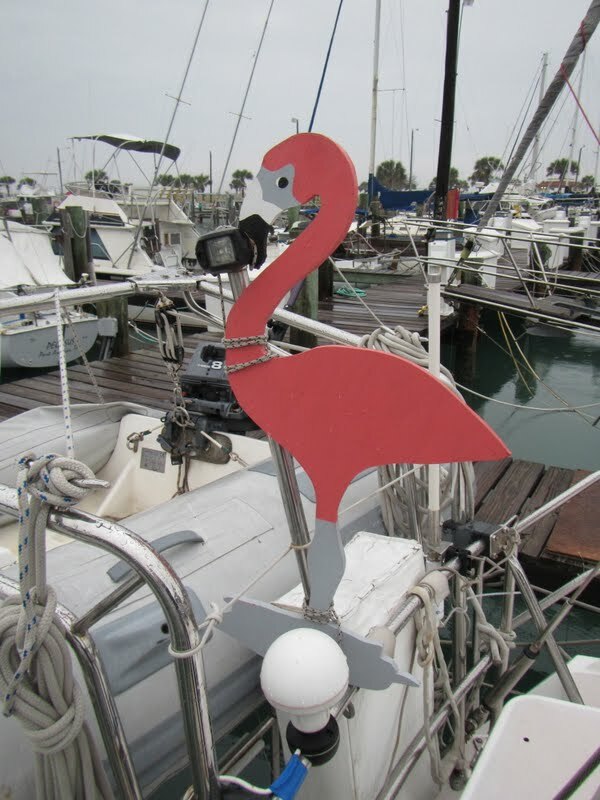 Things we did today...: Please Don't Repossess Our Flamingo! Sign of the "cool people" on our dock! Many of our friends share the common bond of sailing. It's just easier that way as our non-sailing friends just don't get it... and there's certainly no shortage of sailing folks in our circle. Even so, it seems as if our commitment to the Cruising lifestyle, and what it is going to take for us to achieve our goals in the time we have left, is proving to be somewhat foreign. Until now... It seems as if we've taken a detour… we've gone off down a different path. With my "retirement" date set for less than 6 months out, we have to really watch our spending.. I'm very nervous about quitting my job and reducing our income by more than half. We have economized in every conceivable way including spending less on food ( little or no dining out), we have cut out frivilous travel (we will be traveling soon for a wedding), and we've not seen a concert or theater production in… I can't remember the last. We've even let our Yacht Club Membership go… Before we do or buy anything, we ask ourselves… does this further our cause? If the answer is no, we pass it by. Before we moved aboard, there were many weekends when we weren't at the marina. Now we're always here when our friends come and much of the weekend entertainment when we aren't sailing, revolves around dining and drinking. Many times its an impromptu run to a local restaurant for dinner which ends up costing us about the equivalent of that new dock line we would like to have, or maybe a couple of LED replacement bulbs. When I look at it that way… the dinner wasn't really that good. It isn't always that way… Many nights, our gang will all meet on one of our boats for dinner. That couple will host or maybe we'll do a mini pot luck. These are great because everyone brings something so nobody feels like a mooch. Plus the drinks are much less expensive and everyone gets what they want if its BYOB. If I had to judge, the food is actually BETTER! Good times for me are those spent lounging around the boat in our jammies with good friends. Plus, there are no unsympathetic witnesses should things get a little bawdy (you know who you are)! Bruce and I had a frank discussion about these things. I wanted to make sure that we are on the same page for when the next group invitation comes along. Do we want to drop out from our circle of friends? OF COURSE not. But we can't continue trotting off to dinners out, splurging on food when we only really wanted the company. It seems as if we've put ourselves into a different "category", we're no longer tourists on holiday when we're at the marina… we LIVE here. Somehow we have to find a balance between our daily lives and our goals…while still having some fun! A friend reminded us of something… He said "you can't just give up everything that you enjoy in life". This is true. What we need is to set a very firm budget for "entertainment". It will be necessarily small, but it will give us a little wiggle room for those spontaneous dinner runs so we won't be struck completely from the invitation list. With all of the things we are giving up to live our dream, we want very badly to keep our friends. We just need to figure out a way to fit in with the crowd while staying true to our self imposed savings regimen. What we need most from friends and family, was mentioned above in the definition of a Friend… We need support of our Cause. So, if we decline to join in the festivities, please know that it is not that we don't want to run and play… It's because we want to sail off into the sunset, where we hope you ALL come to visit! So... Keep us in the loop and try not to talk TOO badly about us when we aren't there!